Each evening, once the dinner utensils have been cleared away, the imposing figure (all six foot nine of him) slowly takes a small splinter of wood from his pocket, listens to it intently for a while, then proceeds to relate the next instalment of his adventures aboard the ship Jason commanded on his quest to reclaim the Golden Fleece. The small group of officers and workers on the ship listen spellbound to the tales the impressive Caeneus spins, stories of a visit the Argonauts paid to an island inhabited only by women. Inspired by the scrap of wood, said to be a relic of the old ship, the mate and his whispering muse entertain and enthral his listeners during their enforced delay in Norway. 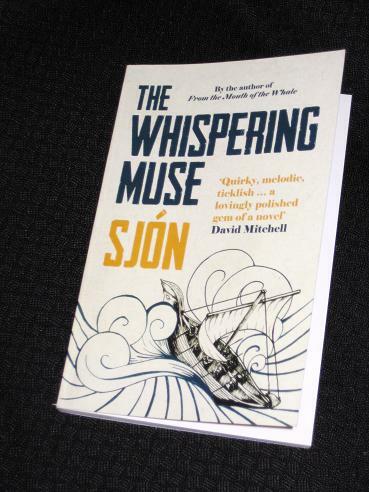 Anyone who has tried From the Mouth of the Whale will know the effect Sjón’s blend of lyrical excellence and inspired imagination can have on the reader, and The Whispering Muse is every bit as wonderful and mad as its translated predecessor. What it lacks in volume – the book is easily read in a couple of hours -, it makes up for with a bagful of ideas scattered like fairy dust throughout the story. The mixture of Greek mythology, pompous quasi-academic self-importance and Nordic sagas (supported by a healthy diet of fish) is guaranteed to confuse, confound and entertain. Of course, there’s more to The Whispering Muse than merely 140-odd pages of amusing story-telling – the problem though is figuring out exactly what themes the cunning writer has woven into the tapestry of his work. The setting, post-war Europe, could be giving the reader a hint here. Haraldsson, an Icelander living in Denmark, was a Nazi sympathiser during the war, working in Germany translating propaganda into his native tongue, and there are glimpses in the story of a man, and a region, attempting to come to terms with the end of the conflict. The story of the Argonauts’ visit to Lemnos could also be seen as a sort of parallel to Haraldsson’s own stay on the ship. Both stories are excerpts, interludes in a wider narrative, and when Caeneus tells the crew of the Argo’s voyage from the Mediterranean up to the wilds of Ultima Thule, it’s difficult not to compare this journey to the one the MS Elizabet Jun-Olsen is about to undertake – or indeed to the one Haraldsson must have endured to get from Iceland to mainland Europe. Hhmm you make it sound so good but I'm the one person in the world who didn't get on with From The Mouth of the Whale. If this book dropped accidentally into my hands I might give it a go but my previous experience of Sjon says “don't bother”. I have The Blue Fox at home and haven't read it yet, which is rather a shame as this sounds absolutely wonderful. Still, I can't buy a Sjon before reading the one I already have. Max – I've just renewed my library copy of 'The Blue Fox', so I have another four weeks to have a go at it (even though it'll take about ninety minutes! ).